This coming weekend’s VINTAGES release will parlay values from around the globe into the meeting place of Ontario stores. Many of the bargains tie directly into a PB and J campaign, a parochial bandwagon advertising juggernaut. 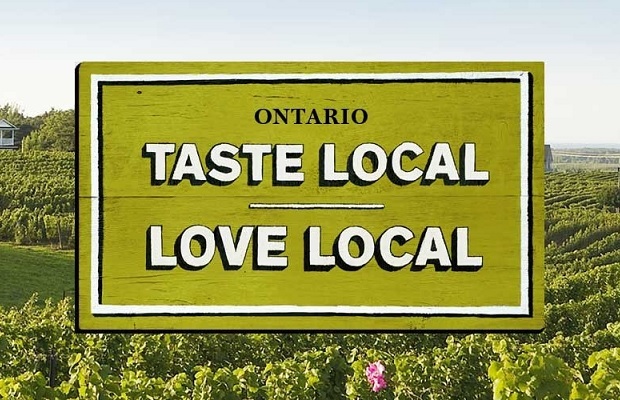 The LCBO and Wine Country Ontario‘s #Tastelocal, #Lovelocal and #LCBOGolocal slogans are currently omnipresent, fast forwardly gaining both steam and traction with restos, critics and consumers. The late, great VINTAGES wine facilitator David Churchill once told me that putting together Taste Ontario was one of the LCBO’s great endeavors. David said the work and time that VINTAGES allotted the event was extraordinary and great care was always afforded the exercise. Next week the chance to taste the most current, largest and impressive cross-section of Ontario wines in one setting will happen with the annual Taste Ontario gala event. When Wine Country Ontario comes to town and joins forces with VINTAGES, it is the writers, sommeliers and restaurant wine junkies who collectively jump trains, catch flames and do what they do. This in the name of getting to know Ontario wines. On September 27th VINTAGES will release the following 17 wines, though most will already be on shelves before you skim through this tasting note report with all the brevity you can afford. This week’s recommendations come by way of one Sparkling, four Chardonnay, two Riesling, three Pinot Noir, a Sangiovese, a Malbec, a Veneto, a Zinfandel, one Rhône and two Bordeaux blends. This entry was posted in Blanquette De Limoux, Bordeaux, Bourgogne, British Columbia, California, Canada, Casablanca Valley, Central Otago, Chianti Classico, Chile, France, Germany, Gigondas, Hemel En Aarde Valley, Italy, Languedoc, LCBO, Mendoza, Napa Valley, New Zealand, Niagara on the Lake, Okanagan Valley, Ontario, Rhône Valley, Rheingau, Short Hills Bench, Sonoma, South Africa, Sparkling Wine, Tuscany, Veneto, VINTAGES, VINTAGES Releases, Walker Bay, Wine Country Ontario, WineAlign, Wines Tasted and tagged #GoLocal, #LCBOTaste Local, #LOveLocal, Alcoholic Beverage Manufacturing, Ann Sperling, Anthony Hamilton Russell, Beverage Manufacturing, Beverages, Burrowing Owl, Cabernet Franc, Cabernet Sauvignon, Chardonnay, Château des Charmes, Château Léoville-Las Cases, Creekside Estates Winery, Culture and Lifestyle, Delmas, Domaine Brusset, Domaine Marchand Grillot, Drinks and Beverages, Errazuriz, Food and Beverage Sector, Food and Cooking, Food and Wine, Francisco Baettig, Grenache, Hamilton Russell, Henry of Pelham Family Estate Winery, Kim Crawford, Kistler, Luigi Righetti, Malbec, Merlot, Michael Godel, Morey Saint Denis, Paul Bosc, Peter Gamble, Pinot Noir, Red Wine, Riesling, Riesling Kabinett, Rihanna, Rob Power, Sangiovese, Sauvignon Blanc, Seghesio, Sonoma Coast, St. Julien, Syrah, Tasting Notes, The Jerry Garcia Band, The Rolling Stones, The Strokes, Valpolicella Classico Superiore, Versado, Vineyards and Winemakers, Viticcio, Wegeler, White Wine, Wine, Winemaking.